I see technology as a tool to enhance the skills necessary to tackle an English course, rather than a new skill to be taught. I often ask, “What technology enhances the skills I am already teaching?”. As a fellow, I was able to explore a wide variety of tech tools that help build writing skills. Most of the technology that I’ve grown to appreciate and value were tools that helped my students understand the key components in an essay. One such example is Verso. 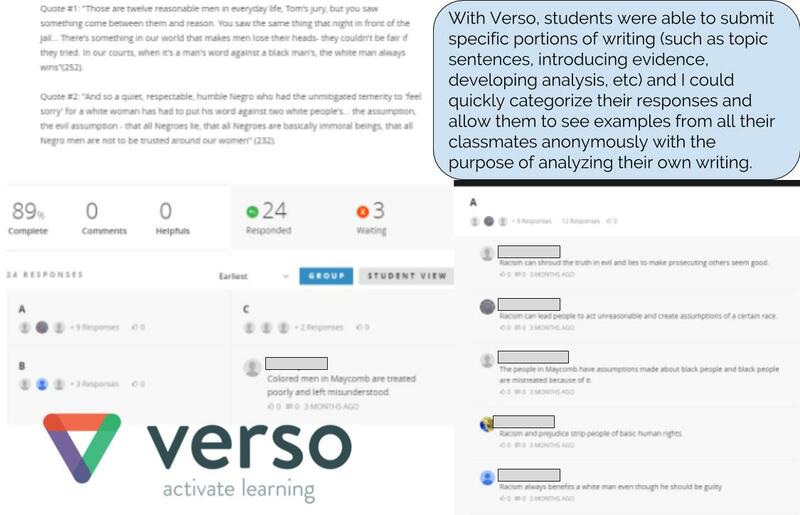 Verso allowed me to hone in on skills, such as introducing evidence, writing topic sentences, and developing analysis. In addition, the feedback was quick. Categorizing student’s answers by grade level allows students to see how they would be graded, what quality of work they were producing before they actually earned a grade. This form of formative assessment gave students the space to ask questions about their writing, which fostered more individualized conversations about their writing. In addition, the anonymity provided students with a wide variety of examples. This fostered good conversations about writing quality. 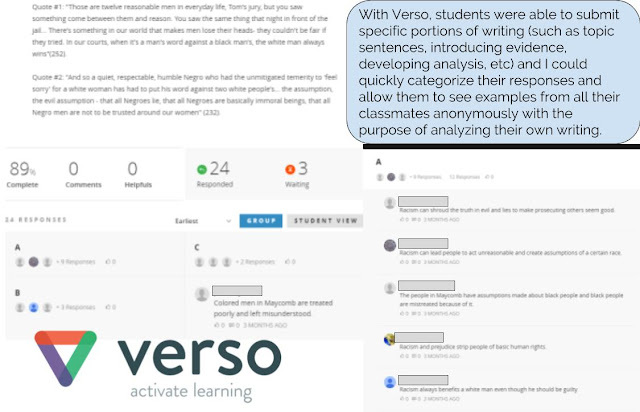 As a result of several Verso activities, students asked questions and evaluated their own writing in a way I was not able to see before. 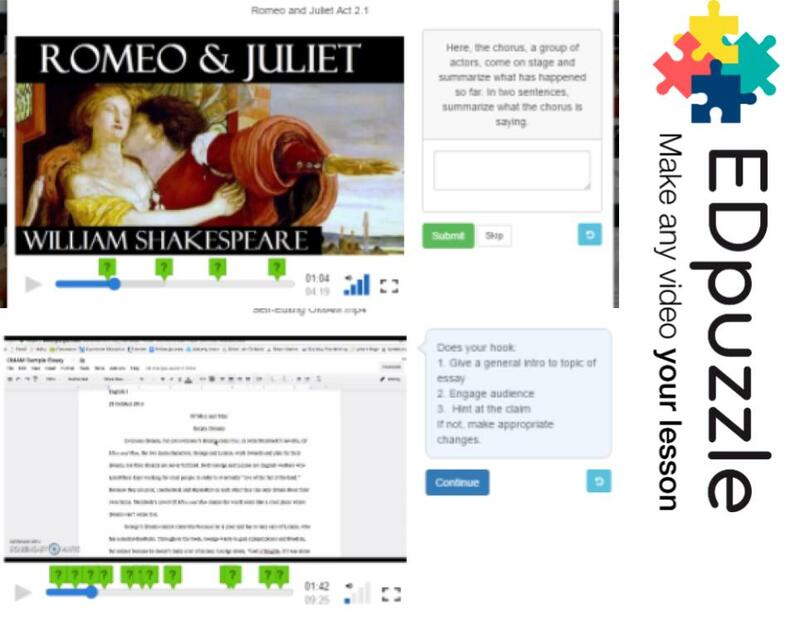 The second tool I found beneficial in the classroom was EdPuzzle. I used EdPuzzle in a variety of ways: reading assignments, writing scaffolding, mini lessons. I found the most success using it as a reading tool. I uploaded the audiobook of Romeo and Juliet (scene by scene) and then inserted my reading check questions in the video. I found this useful for both my strong students and struggling students. The strong students were then able to move onto analysis during class discussion. The struggling students were given a scaffold and important parts to focus on while reading. Students the next day were able to focus on analysis and close reading, as opposed to plot-based questions. In addition, EdPuzzle kept my CP students accountable for reading, which is a common struggle. As the teacher, I could go into EdPuzzle and look at student responses to the questions and open up class discussion with questions students struggled to answer. I was more clearly able to see which areas of the text my students needed to discuss. My goals for next year are to improve class discussion. I want to foster a stronger sense of community in the class so students feel safer to discuss their ideas without judgement. In addition, I want to provide stronger annotation/close reading instruction. I hypothesize that if students feel confident about their reading skills they will more likely discuss their ideas in class and in front of others. The technology that I used this year helped me scaffold writing structure, but next year I’d like to focus on refining students understanding English Language Conventions. I hope to use EdPuzzle in order to create interactive lessons featuring important grammar concepts. The number one benefit of the Tech Fellowship was the reflecting I did. I felt that I had to think more critically about what strategies I was using in the classroom and if those strategies were really meeting my goals. The fellowship forced me to change some of my teaching practices because I was recognizing some students’ needs were not being met. On the other hand, it also helped me stay confident in some of my current teaching practices.